Winner of the Oufuji Noburou Award at the Mainichi Film Awards in 1983. "I dug my father, sister and brother out of the ruins. Their skulls and other bones were intact. I thought humans became like that when they were burnt. When my mother's body was cremated however, there were very few bones. It made me shake with anger that the atomic bomb radiation deprived my mother, who had survived for 21 years, of even her bones. I vowed never to endure wars or atomic bombs"
On Moday, August 6th, 1945, the US bomber Enola Gay dropped the atomic bomb known as "Little Boy" on the city of Hiroshima, Japan. The explosion killed around 70,000 people immediately, with almost as many again dead from the resulting radiation by the end of 1945. Nakazawa Keiji, the author of Barefoot Gen, was 6 years old at the time of the bombing, and is one of the survivors of the destruction of Hiroshima. The bomb was responsible for the death of his father, his sister, and his brother. At the age of 6 he and his mother dug their remains out of the ruins of their home. In 1963 Nakazawa moved to Tokyo to become a manga artist, but returned to Hiroshima in 1966 to attend his mothers funeral. It was his discovery of the true impact of the radiation from the bomb that inspired him to risk becoming a social pariah by openly discussing his experience of the bomb with the first of his "Black" series, Beneath the Black Rain. Barefoot Gen is the autobiographical account of his experience of the bomb and radiation. The manga was fraught with problems because of it's nature and content, and was effectively sidelined by mainstream publications. In 1976 however, a volunteer group called Project Gen was formed, and they took on the task of producing english translations of the manga. In truth, Barefoot Gen was the first manga to be translated and published in english. The story was later adapted into three live action movies, two animated features, and a TV series, however the first anime movie adaptation remains, to this day, one of the most harrowing versions because of its counterintuitive nature. As the story in Barefoot Gen is predominantly autobiographical it is difficult to consider it in terms of a normal story. The anime loses out to the manga in certain repects because sections had to be left out, however this in no way takes away from the story which remains an reasonably accurate, if abbreviated, account of Nakazawa's sof the bomb and its aftermath. The art style is unusual in that it adopts a more "cartoony" approach compared to other anime, however the movie manages to attain a certain ethereal quality that the manga cannot match, especially in its depiction of the results of radiation sickness. The atomic blast is rendered with shocking clarity, and the transformation of people into "monsters" (from Gen's perspective), is horrifyingly realised. Althought production values may be dated (the anime is over 25 years old now), the movie should not be marginalised on the basis of "poor" animation. The cartoon like quality of the characters only adds to the emotional impact, as it is a stark contrast to how "normal" cartoon characters are depicted. Sound is another area where the movie shows its age. The effects, although well used, can sometimes be overwhelming for the viewer, while at other times the various noises are relegated to the background. This can give the movie a slightly "off-kilter" feeling for some viewers, but for the most part the sound and visuals work well together. The music is generally good throughout the movie. The various pieces used to enhance the impact of a given scene are generally appropriate and fairly well choregraphed, especially during the more foreboding scenes. The variety of tracks complement the pervading atmosphere of the film, and most surprising are the scenes where music, noise and visuals combine to give the viewer a truly visceral experience. The characters are a bit of a tricky subject in Barefoot Gen, as they are generally taken from the people that nakazawa met before, during and after the bombing, whilst Gen himself is Nakazawa as a child. Granted, there is obviously a degree of artisitic license with both the design and the portrayal, however this in no way diminishes their impact of the overall movie. Because of this things like character developmentand interaction are difficult to consider, especially given the fact that this is mainly a factual account, and in the absence of of evidence to the contrary, I prefer to think of the characters as "real" - at least, for this movie. Watching this movie is a truly harrowing experience. There is no real way to "enjoy" this in normal terms, especially given its history and content. Very few movies, especially animated ones, are able to convey the level of emotional impact that Barefoot Gen achieves, and only Grave of the Fireflies or Ushiro no Shoumen Daare can be considered equal in terms of content and viewing experience (although the former deals with the aftermath of the firebombing of Kobe, and is semi-autobiographical in nature, and the latter is more of a historical fiction). Although there are similarities between those two movies and Barefoot Gen, there are major differences as well. It is extremely difficult to compare any other anime or manga to Barefoot Gen as no other work is taken directly from real life. If you decide to watch Barefoot Gen then you cannot compare it in any way to shows like Neon Genesis Evangelion, Death Note, Akira, Code Geass, or any other popular movie or series. You cannot use normal standards to judge this movie. In all honesty, Barefoot Gen isn't something to enjoy, even though it ends on a hopfeul note. This is a movie to be experienced, as it is the story of a boy who has literally seen hell. It is both a lesson and a warning for future generations of the true horror of nuclear and atomic weapons, and I urge everyone, whether you're a fan of anime and manga or not, to read the books and watch the movie. This movie talks about, shows and documents to the viewer the harsh reality of the Japanese people living in Hiroshima during the year of 1945. Now where have I seen this concept done before? That's right. This movie was so influential to the point where it influenced Studio Ghibli's Grave of the Fireflies. When you influence a studio as illustrious as Ghibli, you must be doing something right at the very least. Barefoot Gen did many things right to say the least. The movie opens up on a bright note, beginning with a father and his two boys, Gen, the protagonist of the movie, and Shinji, his younger brother. The opening of this movie is so positive to the point where I was bobbing my head to the catchy opening song, and thinking "Yup, this is definitely going downhill from here." It begins off by showing us just how loyal some of the Japanese are to their country, they scream and shout "Banzai" before sending their fellow comrades off to fight the enemy, and then singing what is supposed to be the national anthem. It shows us how loyal the Japanese were to their country, to the point where they just aimlessly take orders, shouting and screaming, and then going off to face a bigger enemy where they could die at any given moment. Gen and his little brother, like the children that they are, start singing the anthem as well when they hear it, hoping to also be heroes and contribute to their country too. Just like how typical children would act, not knowing of the dangers that await them beyond the horizon of their imaginations. They then become hungry after five seconds of singing and complain about how their bellies are void of delicious sweet potatoes. This shows us how kids have dreams and aspirations they want to fulfill, yet are too weak and immature to understand the hardships that come with life, and how heavy the weight of those aspirations really is. We see how war brings so many struggles with it, the lack of water and food being a major one. It shows us how two strangers will hurt each other for a bowl of soup, and how even blood related brothers like Gen and Shinji wouldn't mind doing the same as well, just to shut their hunger up for a while. This movie has a wonderful cast, and some heart warming scenes. A pregnant woman hugging her two kids, showing us how family is the best thing to have when a person is struggling during very hard times. Things start to go dark after the first alarm in the movie goes off though, as the movie starts to show us how everyone is equal in the eyes of the enemy. From small children to the elderly, nobody is safe from a bullet or two. The scene of a little girl dying serves to show two things: The first being how cruel war can be, even killing an innocent little girl who didn't do anything wrong. The second being to show the contrast between Gen and the others like his mother, and how immature Gen is compared to the rest of his elder family members. Here is where we start to see Gen's influence on the main character of Grave of the Fireflies, as Gen suggests to his mother that the enemy is just playing jokes on them, while the mother scolds him for such an ignorant statement, mentioning the little girl's death to show him how war is everything but a joke. Gen is very naive and does not want to be serious for once, he prefers to think lightly of his situation while everyone else is working hard. Though he actually does learn a lesson or two a couple scenes later, and he actually helps for once by bringing his mother some food, he is still naive, but he's helpful and willing to go to great lengths for his sick mother. We get a scene showing us the father's perspective on why he hates the government. He hates them due to them being madmen and not stopping the war, and honestly I would not blame him, a guy who has children to feed, working all day to provide for them, I feel sad for him because he just wants what is right for his kids and other families that are suffering as well. After that scene, we see a plane start showing itself over the top of the city. When Gen sees the plane, he starts to joke about it, saying how it is a spy plane and is nothing to worry about. Oh boy was he wrong!!! We finally arrive at what I would say is one of the best scenes ever put to animation. How good was this scene... my God. How good it was at showing us how truly disturbing the Hiroshima bombing was. After the plane drops the nuclear bomb, we see some of the most bloody scenes ever put to animation, it's all the more terrifying when you realize this actually happened and was a real event that went down in history. It's mind blowing how five seconds before this we had a happy family, where the sun was shining over normal looking, healthy people, and then we immediately turn 180 degrees. The family is no more, most of the citizens suffered extreme burns all over the body and died, and everything burned down to ashes. Literally the only positive thing was Gen's change in personality from a naive and immature boy to a man. He's amazing. The war does not affect him mentally like it did his mother and some other people. He is truly amazing. After seeing his beacon of hope die in front of his eyes, Gen finally realizes that he has to do everything in his power to fill his father's shoes. We get to see Gen make relationships after the war, helping other people to earn some money for his mother and his new siblings. Listen, when I say every character gets development, I mean every one of them gets development, even a maggot infested brat does. The thing that kept me happy during all of this depressing movie was Gen's determination and strong will to help those around him, and how he matures throughout the movie. It did everything right, it impressed me and exceeded my expectations by a long shot. Barefoot Gen is in my opinion one of the most underrated anime on this site. In the West, it is completely overshadowed by Grave of the Firefly, which is unfortunate because in many ways Gen is actually the superior film! In this review I will be not only looking at Gen, but comparing it to its much more famous and critically lauded brother Grave of the Firefly (Hotaru no Haka). Barefoot Gen opens by showing the main character, a little boy named Gen, along with his family. Gen has a little brother named Shinji, an elder sister Eiko, a father, and a mother who is currently in the late stages of pregnancy. Barefoot Gen shows the family trying to keep their chins up and appreciate the small joys left in life despite the food shortages and the looming danger of air raids. By spending more time showing happiness and cheerful character interactions than Firefly, it makes the impact of the tragedy even greater when it inevitably occurs. Barefoot Gen is roughly the same length as Firefly, but it feels much shorter, even though it is far more brutal in its portrayal of war. Even people that prefer Firefly over Gen would have to concede that Gen is a better paced film. It is long enough to feel for the characters and connect with them so that the tragedy is painful and horrible, but not so long that it overextends its narrative and drags. The character Gen is based off the writer of the original Gen manga, who survived Hiroshima as a young boy. Some people criticize the realism of the characters because Gen stays so upbeat in the face of unimaginable tragedy, but that is exactly what he needed to do in order to survive. He wasn't able to stop and fully process the loss of his family when he was desperately looking for food to keep himself and his mother alive. This isn't unrealistic, but rather the human survival instinct kicking in. If Gen had pulled a Shinji Ikari, he wouldn't have lived to later tell this story to us! Gen's father is based loosely off the author's real father and is unique in that he dares to criticize the Japanese government for not surrendering when in 1945, it was clear Japan couldn't possibly win. The father character is strongly against the war, which reflects the attitude of both the author and his real life father. Later Gen meets another little boy named Ryota who I admit brings some tone jarring slapstick out of nowhere. The only area where haters of this film may have a point is that Barefoot Gen does suffer from some SERIOUS mood whiplash. It shows one of the most brutal sequences ever animated in one scene, but has Ryota and Gen roughhousing and laughing about 10 minutes later. Animation is a visual medium of storytelling, so it is better to show than to tell. Barefoot Gen shows the horrors of nuclear war better than perhaps any other movie ever made be it animated or no. I'm serious! The horrible brutality of melting eyeballs, scorched flesh, maggot infested wounds, and all the stages of radiation poisoning are captured accurately and with an unflinching eye. Barefoot Gen is NOT a good movie to show little kids. The art style is curiously juvenile in order to create a sharp contrast between Gen's innocence and the horrors of war. Although I see what Barefoot Gen was trying to do, this art style choice may not work for everyone to portray such scenes of carnage. Grave of the Fireflies is a much more polished, larger budget, and better animated film. However, I give Gen the edge here for daring to show in full detail just why nuclear weapons are so horrible and morally unacceptable. Roger Ebert said that Grave of the Fireflies was one of the greatest anti-war films ever made, and since then American critics have viewed it in that light. However, the writer of Firefly explicitly stated it is NOT an anti-war film saying war in general is bad. He merely wished to show Japanese children the suffering and injustice that Americans did to Japan. He also wished Firefly to act as an Aesop's fable to tell the unruly Japanese youth of the 1980s to obey and tolerate adults. Japanese audiences were supposed to take away the message that if Seta had put up with his bitchy aunt, he and his sister would have lived. That was the main moral of the movie! Rather than an "anti war" masterpiece, Firefly is a preachy "Obey adults you little brats" film that is extremely anti-American and perpetuates the narrative that Japan was entirely a victim during WW2 to a new generation of Japanese youth. Barefoot Gen on the other hand actually IS an anti-war film that wishes to show that war is suffering, death, and evil. Barefoot Gen shows a balanced view of the war and shows both the innocence of Japanese civilians and the callous cruelty of the Japanese WW2 government, who is just as criticized in the film as the Americans. The reason Firefly lays all blame on the Americans and never says a word of condemnation for the WW2 Japan government is because the writer of Firefly had no qualms with the WW2 Japanese government, unlike the writer of Gen. In terms of themes and politics, it was GEN that deserved our praise all along, NOT Firefly! The last major difference between Gen and Firefly is how they choose to end. Firefly ends with soul crushing depression and all the characters dying. The beautiful Japanese Empire has been crushed and all good is gone from the world. The characters are all dead, so they don't have to learn how to move on and rebuild towards a better future. Gen despite the film's extreme brutality ends with a note of optimism. Wheat is shown growing even though American scientists predicted that nothing would grow in Hiroshima for 70 years. The character Gen must learn like all those who survived the war to deal with the extreme loss and tragedy, as well as build a better Japan from the ashes. Gen doesn't just lament the beauty that was lost, but asks for such carnage to not be repeated again while working to build a better world. The endings are different because the 2 films have VASTLY different messages, but I must say I strongly prefer Gen's ending. Gen may have a few minor flaws, such as a juvenile animation style that some may feel clashes with its explicit portrayal of brutality. Others may dislike the tone shift between the lighthearted scenes and tragic scenes that occur very shortly one after another. I however, think that Gen is an overlooked gem that deserves FAR more praise than it receives in the West. All the praise that was showered on Grave of the Firefly in my opinion should rightfully go to Gen, the superior film! Note: In this review I will be talking about both Barefoot Gen (1983) & Barefoot Gen 2 (1986) in every respect even though there is a 3 year gap in production between the two movies I don’t really feel there is much of a difference with anything in particular. In many ways both films would have worked better a single release. This would have made more sense as the two movies address two different aspects of the given situation. Also considering the subject matter is quite difficult for many to digest I actually feel having the two films separate has hindered the second movie. Using animation to tell this somewot autobiographical account of the Hiroshima disaster personifies the unique tool animation can be to tell a story. Although stories like this which are based on true events will always be the subject of some sort of criticism I have to commend Keiji Nakazawa for putting this out there in such a vivid way that still to this very day many similar titles based on WWII do not accomplish even outside the realm of animation. The story begins on August 4, 1945, in Hiroshima with the everyday life of Gen, his younger brother Shinji, their father Daikichi, elder sister Eiko, and pregnant mother Kimie, during the final days of World War II. The beginning of the plot mainly focuses on the Nakaoka family's struggle to afford food ration cards and other items due to food shortages throughout Japan. Like the other residents, the family wonders why Hiroshima has so far suffered only minor damage; when American B-29 Superfortress bombers have fire-bombed nearly all of Japan's major cities. A few days later, on his way to school, Gen takes notice of a passing B-29 aircraft and discusses with a female friend how odd it is that a single B-29 would be passing over the city with no air raid siren warning beforehand, as was often common. Soon after this suddenly his father, sister, and brother watch their surroundings as they are all blinded by a flash of white light which is then closely followed by the tremendous explosion. This is the moment Gen’s life changed forever. Due to me NOT giving spoilers what I will summarize is that what follows is the tale of a young boy and his “cough” family’s ordeal through one of the greatest tragedies the world has even known and how he and the people around him strive to survive in the aftermath left by the atomic blast. 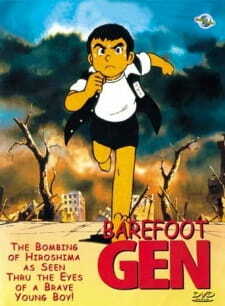 Barefoot Gen 2 takes place 3 years after the end of the original movie, with Gen trying to cope during the early post-war reconstruction of Japan. While the first movie focused more on the immediate affects of the atomic bombing, the second film focuses more on the long-term problems that faced the survivors, such as the devastated economy and national infrastructure, and lingering affects of the bomb's radiation. The ONE and only thing I do not like about the story is that it focuses so much on the actual attack dealt by the Americans, viewers who do not know their WWII history may see this film as a horrible injustice to the Japanese and there are no mentions of Japans previous participation in the war which includes the slaughter of the Chinese during the invasion of china or of the attack on Americans at pearl harbor – which I must STRESS is not me hinting in any way that they had this coming to them…I’m just saying if you do not know the entire history of WWII this film does not educate anything relative and can be seen as propaganda which I feel is not the intention of these movies at all……but hey I’m goin off on one here…you get the point. Animation style is a bit cartoonier than the typical Japanese animation style, especially with the character designs. I do however feel this animation style made things more clear, simple and vivid, particularly with the atomic blast sequence and the various human transformations (goddamn) – this was a truly horrifying but mesmerizing experience which I must again commend Keiji Nakazawa’s graphic and barebone depiction of the actual atrocities he witnessed. It really does feel like a living nightmare at these points. Landscapes and background designs where simple yet decent considering this title is over 25 years old I was not expecting all that much anyway but overall everything was animated quite well no real complaints. I have watched these titles twice. The first viewing was of BFG1 and it was in English dub which in my opinion was very good. BFG2 has no dub so I watched them both again with the original Japanese language and English subs. Here again I found no problems with voice actors or music. The only real downside was some of the actual sound affects felt dated and come off sounding sharp, especially during the explosion sequence. Other than that I have to say the overall language interaction and dialogue was good across the board. Well I did like the characters and I did feel they exhibited a lot of real emotions but really the main character Gen himself to me was just a little bit unbelievable, why I say so is he just is so damn positive and optimistic in the face of the most horrifying events….he did have his moments of sadness but really they did not last very long before he was up and running again. Now I’m not stupid he was ultimately the main plot device and the spirit of encouragement for both movies which was undoubtedly essential to these movies. Without someone like Gen in the movies this would have been the saddest and most depressing anime of all time…I also understand he was a kid and maybe could not fully process the full extent of the situation but I still just felt he was just a little bit unrealistic in certain situations. The other characters around Gen seemed more believable…a lot of them where suffering and in some sort of agony but I liked the fact the story showed characters of all ages and how they where affected by the situation. Considering the situation however the character development could have been taken advantage of a bit more in my opinion…then again I may be asking for too much. How can anyone use the word enjoyment for something like this…what I can say is i appreciate and applaud the author for having the guts to create something many people today may be totally oblivious to and to do so in such a way that is rarely seen but at the same time to not dwell totally on the pain of the disaster but also the spirit of perseverance and determination. The level of despair these titles reach is truly not enjoyable but at the same time one must remember these events actually happened, maybe not all to one person but to a whole range of people and for that I feel this is something as an anime fan, a historian…hell even as a human being should be watched at least once….but be warned this is not for the fain hearted! It really irritates me this title is often compared as the weaker version of Grave of the fireflies. Yes they are similar and yes GOTF has better animation but I feel GOTF was more of a stand alone story on a smaller scale. These movies however have a much clearer, wider and dreadful message. It takes a bold but realistic look at how nuclear weapons have changed a whole nation’s perspective on life and ultimately ended WWII itself. It’s a damn shame this title is not more well know to the masses and is often just passed off as some manipulative emotional guilt trip movie. These movies do serve a purpose and send both a necessary negative and positive message but most of all it is something no viewer has ever forgotten watching…even if they swear to never ever watch it again and yes many many people will not wwhich is sadly understandable.